Everyone knows that Irish Wolfhounds are the biggest dogs in the land and that a dog's brain is specialized for scent, but here are a few quirky and mind-blowing facts that you probably don't know related to our beloved pups. Fact #1: Dogs are capable of understanding up to 250 words and gestures, can count up to five and can perform simple mathematical calculations. The average dog is as intelligent as a two-year-old child. Fact #2: Some stray Russian dogs have figured out how to use the subway system in order to travel to more populated areas in search of food. Fact #3: Dogs don't enjoy being hugged as much as humans and other primates. Canines interpret putting a limb over another animal as a sign of dominance. Fact #4: Two stray dogs in Afghanistan saved 50 American soliders. A Facebook group raised $21,000 to bring the dogs back to the US and reunite them with the soldiers. Fact #5: The Beatles song "A day in the Life" has an extra high-pitched whistle, audible only to dogs. It was recorded by Paul McCartney for the enjoyment of his Shetland sheepdog. Fact #6: This pup, Nesbit, earned over one million Delta airline miles in his life and had his own frequent flier card. Fact #7: One of Michael Vick's former fighting dogs, Leo, went on to be a therapy dog who comforted dying children. Fact #8: Service dogs are trained to know when they are on duty. When their harness is on, they know it's business time. When you take it off, the pups immediately become playful and energetic. Fact #9: Tiger Woods stuttered as a child and used to talk to his dog until he fell asleep in an effort to get rid of it. Fact #10: Seeing eye dogs pee and poo on command so that their owners can clean up after them. (The command is usually "Get busy!" and pups will pace back and forth until they do their business.) Male dogs are also trained to do their business without lifting their leg. Fact #11:In ancient China, an emperor's last line of defense was a small Pekingese dog literally hidden up his sleeve. Fact #12: When Lord Byron was informed that his dog was not allowed to come with him to Cambridge Trinity College, he retaliated by bringing a bear instead. Fact #13: In 1860's San Francisco, two stray dogs who were best friends became local celebrities. Their exploits were celebrated in local papers and they were granted immunity from the city's dog catchers. Fact #14: There is a dog-shaped building in New Zealand. Fact #15: This dog, Naki'o, lost all of his legs to frostbite in Colorado, but now has four prosthetic legs and can run around like normal. Fact #16: The wetness of a dog's nose is essential for determining what direction a smell is coming from. Fact #17: Hyenas aren't actually dogs. They are more closely related to cats. Fact #18: Spiked dog collars were invented in ancient Greece and were originally designed to protect dogs throats from wolf attacks. 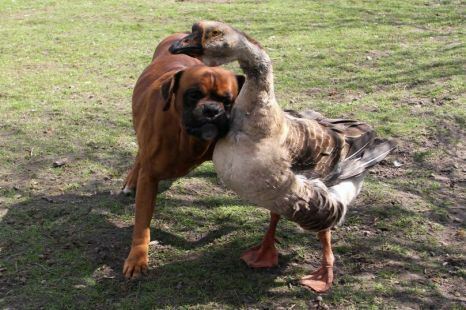 Fact #19: Baks the blind boxer has a seeing eye goose named Buttons. Buttons the four-year-old goose leads her pup around everywhere either by hanging onto him with her neck, or by honking to tell him which way to go. Fact #20: 'Frito Feet' is the name of the phenomenon in which the bacteria on a dog's paws cause them to smell like corn chips. Because a pup's feet are in constant contact with the ground, they pick up tons of microorganisms in their paws. When dogs cool off by sweating through the pads of their feet, the combo of moisture and bacteria releaces a nutty, popcorn-like aroma. Basically it's dog B.O.